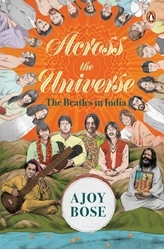 Across the Universe: The Beatles in India by Ajoy Bose- Review . Beatles Radio: The Beatles, Solos, Covers, Birthdays, News The Fab 4 and More! The first thing that catches your attention in Across the Universe: The Beatles in India, written by Ajoy Bose is the bright cover with illustrations of the four members of the Beatles sharing cover space along with sitar maestro Pandit Ravi Shankar, Maharishi and all the others that were relevant to the Beatles story in India. However, the back cover art is a real classic that is inspired by Abbey Road and it shows the four band members on Lakshman Jhula. While there is hardly anyone that didn’t know of the long affair that the Beatles had with India, it was about time that an Indian should write about the Beatles episode in India. And, so it came from a veteran journalist, Ajoy Bose. He has authored two books before, one on the Emergency and the other on Mayawati, both extremely political in nature. Thus, it was quite a surprise to see Bose writing on the Beatles.